When you have more triple-doubles than any player in NCAA history, who can blame you for hunting for a garbage-time rebound? 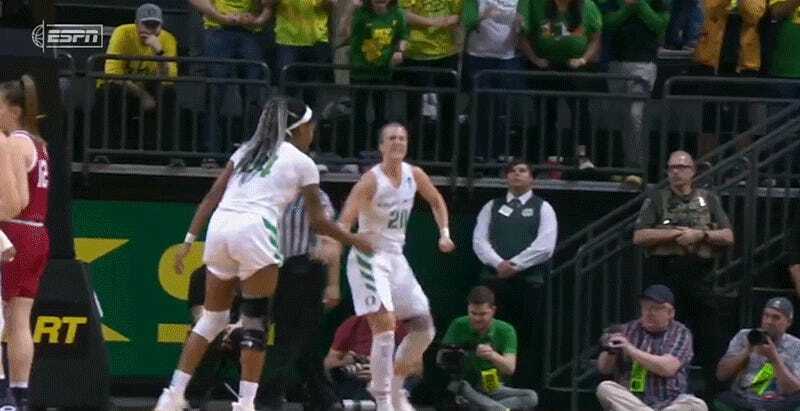 By her own admission, University of Oregon star Sabrina Ionescu deliberately missed a late three-pointer yesterday to collect her 10th rebound, completing the 18th triple-double of her career in a 91-68 second-round win over the Indiana Hoosiers. If she does stay, she could push the triple-double record to nigh-unreachable heights; she had eight this season, and even half of that next year would put her 10 ahead of second place. Ionescu gets another crack at adding to her legacy on March 30, when the second-seed Ducks take on either Syracuse or South Dakota State in the Sweet 16.